Ok, so these two marathons were last minute entries. Although on the waiting list, I didn't know until Thursday if I would gain a place. Thankfully a place per day became available. 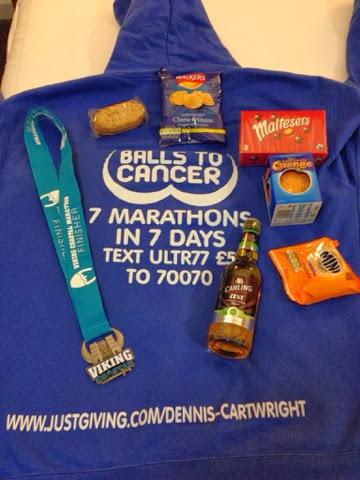 I knew that the event would be well organised, and I had heard good things about the goody bag and medal. When the race organisers are both 100 marathon club members, you could say they are more than qualified to know what a marathon runner would want from a race. We weren't to be disappointed!! The marathons were on the same course for both days. 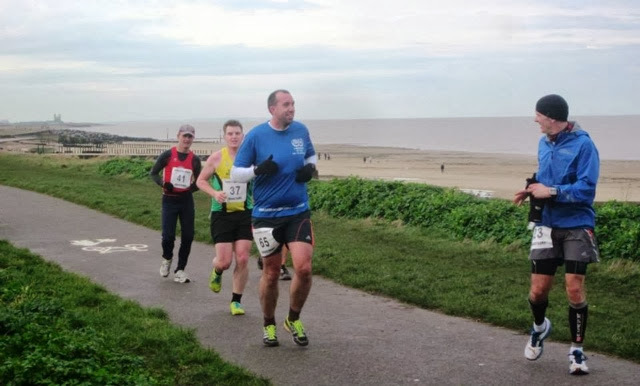 Starting at the sea front in Birchington, Kent, then running 3.30 miles west along the Viking Coastal path to Reculver Castle. Once there, it was just a case of running back to the start area, doing that loop four times. I decided to drive to the race on Saturday morning. The weather was looking promising considering the recent heavy rains. But being a Coastal event, I was aware the weather could change quickly. I arrived in plenty of time and started to see the usual faces from other double marathons. I received my race number for the weekend. Number 65. 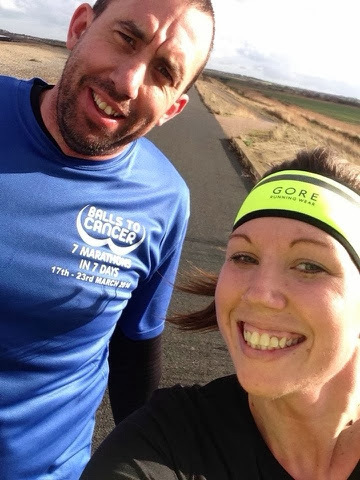 As the weather was good, I opted to give my new Balls to Cancer running shirts their first outing. My plan was to again try and hit a pb, or more specifically 4.22 marathon. Running 10 min/miles as an average. The plan was to run at least halfway at 9 min/mile pace, 16 miles was where I was hoping to hold it for, then I could slow to 11 min/miles pace for the second half. Haven't got my head around negative splits yet. Only down side to my plan, I had forgot my salt tablets?! I soon saw two friends who I knew were attempting their first double marathons. Hannah Prentice and Jennifer Chilton. They both looked a little nervous, but also excited. Hannah was doing marathons 6&7? And Jenny was doing 3&4 (I know, nuts). These were to be 20&21 for me. With our final race brief, a few hello to friends and applause for Rik Verco for doing 150 marathons in 365 days, plus Brian Mills starting marathon number 952!! A uk record by a very large margin, we were off. With the wind at our backs, I settled into my pace and chatted with Stefan for a while. Although I felt the pace was a little slow I pushed on a bit. I was aware that I was now running around 8.45min/mile pace, but I wasn't stressed and stayed happily with it. It was a nice flat route upto the castle, where we turned around 100 yards short of the castle at a gate. As soon as I turned to head back, I immediately noticed the head wind. Joy! I had a plan and I wanted to stick with it, so it was a case of pushing harder back into the wind to keep the 9 min/mile pace going. I was now in a little group, and we were having a good chatter. It was helping. The head wind was making it tough to keep on pace, but I knew I'd get the benefit when heading back out. 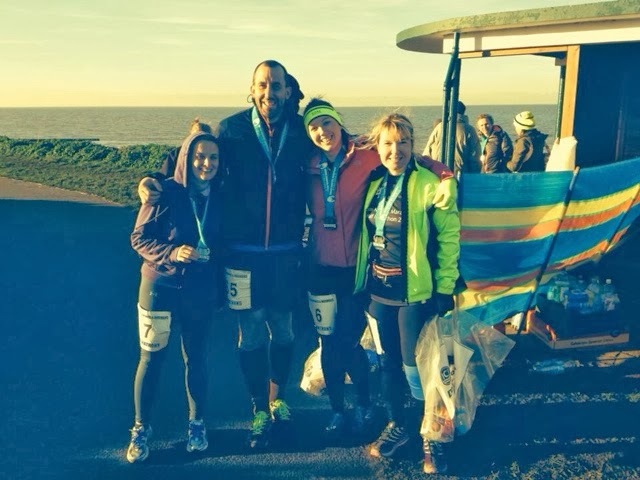 I was amongst some great runners and felt proud of how I was doing. Reaching the quarter distance I took on some shot bloks and headed straight back out. This left me out on my own as the little group spent a bit long at the aid station. I went inside myself a little bit as I pushed on, the head wind now at my back, I didn't feel as help for as the first loop. Nevertheless, I stuck to my plan, occasionally having to slow back to the 9 min/mile pace. To occupy my mind I started counting the field and my position within it. I found myself sitting in 22nd position of a field of 57! I was stoked, but knew there was a very long way to go. I had also set my virtual pacer on my Garmin to 9.40min/mile pace. That would be a 4.15 marathon time. 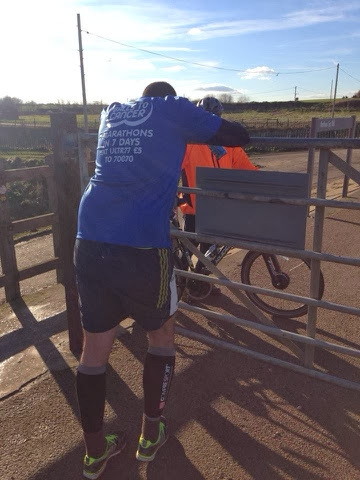 At the second time of touching the gate, I opted to freshen up on the route back into the head wind. I was ahead of my VP by 6 odd minutes, roughly 9 minutes in front of a 4.22 marathon pace. My walks were short, but it allowed me to push a little harder when running without over stressing myself. It wasn't long until I slipped into 23rd. I argued with myself about gaining the place back, but it was stupid, stick to the plan. Not far from the half way point, Stefan pushed me down into 24th. Again I wasted no time here and was back out. My half time was sub 2, so all was still really good. Stefan was soon back on me, kicking my backside. I had decided that I wanted to get back to the gate 5 minutes in front of my VP. So at this point I could afford to slip into approx 9.40 min/mile pace. I soon slipped down into 26th place, but did so with encouragement from the two guys going past me. They knew my target and were very encouraging, which lifted me. It was time to dig deep. I stuck to my revised plan as best I could and arrived at the gate for the third time, 4.30 minutes in front of the VP. The plan now was to see how much of that I could keep when heading back for the bell. I was now the best part of 12 minutes in front of a 4.22. It seemed like a lot of time, but with just under 10 miles to go, it was a small amount realistically. Turning back into the head wind, which now seemed stronger than before, I started to struggle. With my focus purely on getting to the bell as quick as I could to keep the time I had made. I was struggling with cramping, not my legs, but my stomach. All week I kept thinking I need to take my salt tablets to the race. I was now rather annoyed with myself for forgetting them. A mistake which was now costing me big time. I struggled to the bell and the start of my last lap in front of my VP by a few seconds. Still not a loss though. I still had approx 7 minutes in front of a 4.22 and 13 minutes from my pb. This was going to be tough. It's said many times, a marathon is a 20 mile training run with a 6.2 mile race at the end. Unfortunately I had ran a 20 mile race and was slipping into a 6.2 miles of pain, all of it in the stomach. I was stuck in a rut. I was trying to push, my stomach bringing me to the occasional stand still. I was slipping back through the field. I reached the gate for the final time for the day. 4.22 was all but gone. It was now about breaking the pb, even by a few seconds. But I was done. I applied a run walk strategy, but it still wasn't enough. Matt and Jennifer were next to catch me, a bitter sweet moment. With a mile to go, these were the last two to pass me. I had a little chat with Matt, he was doing marathon 99. I then tried to catch Jen. But I couldn't. I finally crossed the line 35 seconds behind Jen. Completing the marathon in my 4th fastest time of 4.39.54. Not a disaster, but due to one mistake of forgetting my salt tablets, I could've smashed my pb. I congratulated Jen on her time, a pb for her by a massive 30 minutes!! We didn't have to wait to long to see Hannah complete day one as well. All three home! Mel Floyd then arrived, which was really pleasing after she had a knee injury during the Winter Double and DNF'd, day two. She was back and the marathon completed! After a rubbish nights sleep, Day Two was upon us. I managed to get a good bacon and eggs breakfast in, before heading to the race venue. It had rained over night, but it looked like it was going to be another dry day. The wind had settled down too. Today was about getting the job done. No time plans, just do what needs to be done to get through 26.2 miles. I had decided if I could to run with Hannah and Jen. Stefan half attempted to convince me to try for a pb, which I laughed off. Another short race brief for those who didn't run day one, and we were off. I started running with Jen, Hannah and Mel chatting just behind us. Jen and myself settled into a 10 min/mile pace. We slowly opened a gap between Hannah and Mel, and discussed if we should run with them. Although I knew Hannah would be happy with Mel, after they ran Berlin together for 95% of it. We soon reached the castle/gate for the first time. Both of us feeling the pace a little, so we started to ease it back to 10.30 min/mile pace. Thankfully there was no head wind to fight! We soon started chatting about all sorts of weird and wonderful subjects. It was nice to be sharing the miles. We were soon finishing our first lap. Time to get some scoff on. Plenty to choose from, cheese balls, pretzels, mini cheddars, peanut butter M&Ms. Water, squash and energy gels. With some scoff on, my jacket removed and Jen catching up with her mum, we were off back to that castle. 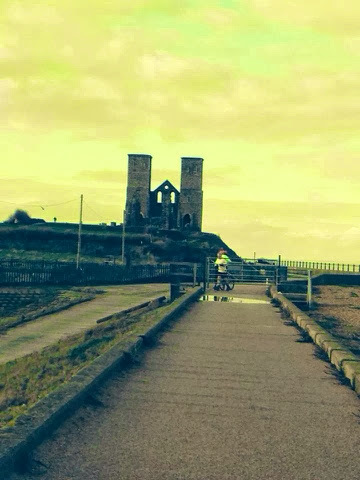 Reculver Castle and the turn around point. We had decided to do a walk run strategy. Easier said then done. Jeans walking pace was unbelievable, I struggled to keep up!!! We were breaking up the course into walk sections and run sections. We were also both aware of little niggles creeping in. My foot was sore and Jens knee was feeling out of sorts. Jens plan for the weekend was to pb day one, finish day two. Pretty much the same as my plan, but I missed that pb. The weather was beautiful and there was many cyclists and walkers out and about. Although I did joke that I wouldn't walk the route. Even though I was running up and down it eight times in two days. The castle was reminding me of the part in Monty Pythons Holy Grail, where King Arthur attacks the castle to save the fair maiden after Concorde took the arrow to his chest. You know, where the guards look and see him charging in the distance, then look at each other, then look back and he's no closer. After a few more glances, he's suddenly there. That's what the carle was like. It just looked like it wasn't getting closer, then suddenly we were there. Still smiling or wind? You choose! Eventually that castle was in front of us. Yes, only needed to see it two more times! We both were surprised to feel our stomachs rumble?! How could we be hungry? We ate lunch in the Brewers Fayre, dinner at Chiquitos and breakfast that morning! We were calorie burning machines. Best get back to that aid station for food!! Easier said than done. Our niggles were now protesting. Making us question what we were doing. No doubt like the walkers we were chatting to. We were soon discussing how nice it would be to have an ice cream. From the halfway point on it was about digging deep for us both. We were hurting from the day befores effort. Our walks were becoming longer than our runs. We were doing what we needed to, getting the job done. I don't remember much of the next loop other than hurting and the castle taking forever. However I did enjoy the bell, signalling the last lap. At this point we were down to walking. Happily, we were passed by Mel and Hannah who were running really well. We stuck to our plan. Somehow we discussed bowel movements and other odd things, including what do dogs think?! Finally the castle and gate arrived. We were 3.3 miles from finishing the challenge. As beautiful as the castle and route is, I'd be lying if I said I would miss it. Although, in the long term I will. Saying good bye to the gate. Just a Parkrun to go, that's what one of the runners said to us. It was true, just a very tired, aching and sore Parkrun! We attempted to run, but it wasn't happening. So it was back to Jens walk speed. 14min/miles! Although we decided that we would run across the finish line. With that last .2 miles in front of us, we set off doing our last bit of running for the weekend. We had fought our demons through day two, we did it wearing smiles. 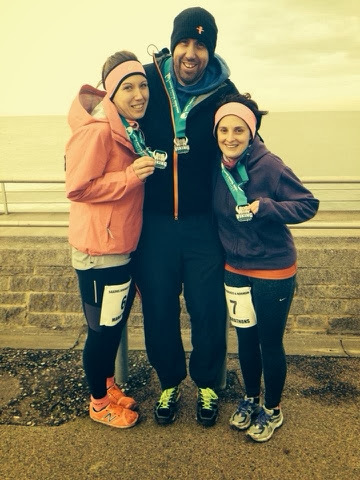 It really was a pleasure to help a fellow runner complete the challenge of doing two marathons in two days. Even if they beat me by 35 seconds collectively! We crossed the line together in 5.42. Without Jen, day two would've been so much harder mentally. Running with a friend to chat to really helps the miles go by. We talked about everything except, war, religion and politics. It was amazing to see Jen complete marathons 3&4. To do your first double so early in a marathon career is bonkers. The same for Hannah. They both set themselves the challenge and they both completed it in style. 100% impressed. It takes a huge amount of guts and sheer determination to complete a challenge like a double marathon. Only a small percentage of the worlds population will complete A marathon, you get into very small percentages to find those who have done two in two days. It really is an amazing achievement. One that should be respected for the challenge it is, but also huge respect for those who take it on and complete it. Well done guys, I'm proud of you! A big thank you to Traviss and Rachel and their support staff for a fantastic event, medal and goody bag. A big thank you to all my running friends at the races and supporting me around the country. 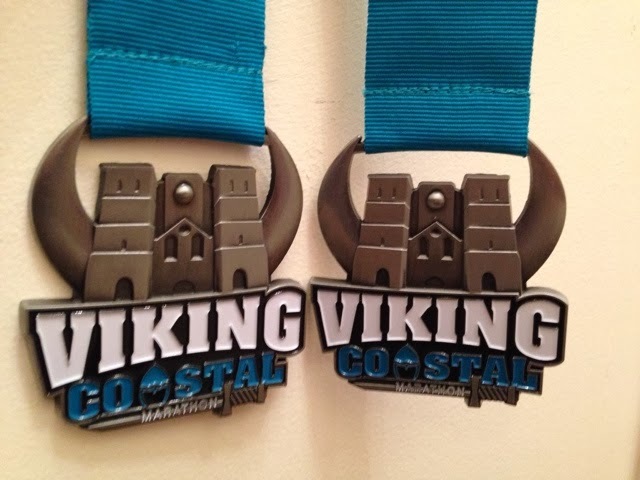 Viking Coastal Double Marathon finishers! Hannah, Me, Jen and Mel.